Too many plans for the weekend? Let me narrow down your options by suggesting some events where you can meet, dance and drink with Amsterdam’s finest crowds. After all, ‘a hangover ain’t worth the pain if the party is lame’. Here’s where you weekend warriors should go to for next Monday’s hangover. 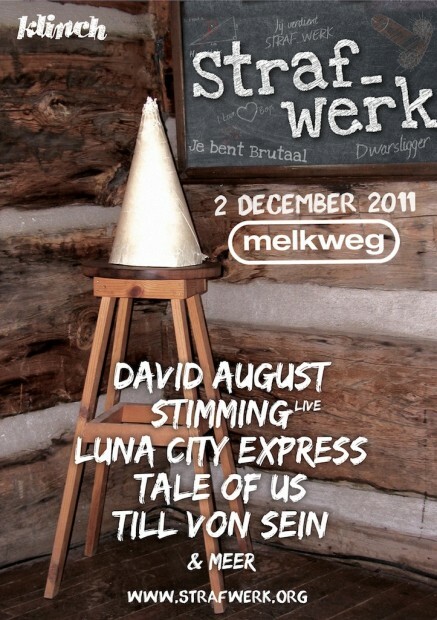 STRAF_WERK, the new concept in town that is raising the bar for house lovers. They’ve kicked off their new concept with a line-up that can only be described as insane. Upcoming stars David August, Tale of Us, established names Stimming and Luna City Express, but also hidden secrets Till von Sein, Noir, Show B & Thomas Herb and local heroes Homework will all hit the stages of our legendary Melkweg. Plus, they also promise a wide range of side entertainment ranging from visuals to acts, all in the Straf_Werk theme. Best detention ever! Read all about it in the previous article we wrote about it. Oh yeah, and there’s an afterparty too: Nablijven. After a successful first edition, De Nachtdivisie invites you to come back to Leidseplein’s Chicago Social Club every first Friday of the month. What’s in a name? A collective of up and coming DJ/producers from Amsterdam that represent the contemporary grooves and deep sounds of our town. Who are these local heroes we’re talking about? Prunk, Mailman vs Tijn Benedek, Tim & Ties, Some Chemistry (that’s me! ), Arturo Frizzante, Hellie Berry and morgen.am’s upcoming hero La Vondel. As a wise man once said: “support your local scene”! For the next episode of their weekender sessions, We Are E is taking you to the French side of things with one of their friends from the South, Rodriguez Jr. Nuno Dos Santos will get things started with his warm and musical approach to DJing. After that it’s all about Mr. Jr! He will start of with a one hour solo live set after which he will continue back to back set with Oliver Weiter until the lights come on. Read all about Rodriguez Jr’s new album/tour on the interview we did with him a few days back. Oh yeah, one more thing. Throw us a comment on this post with your favourite Rodriguez Jr. song on Facebook to win a copy of his Bittersweet album! Paul Rose aka Scuba, the mastermind behind the incredibly well curated Hotflush label, has been enlisted to mix the latest episode in the DJ-Kicks series released a few weeks ago. It features a healthy helping of exclusives from his camp including new music from Addison Groove & Boddika. The mix treads the line between the UK bass music scene in which Scuba came up, and the techno sounds dominant in his current home of Berlin, creating an all new sound in the process. Saturday at Trouw! Lastly, it’s the time of the month for Trouw op Zondag again, still one of my favourite club concepts in town! You can grab a bite or do a dance with a crowd that a mix of people freshly off the boat and others who’ve been raving for the last 12 hours. This specific Sunday brings us a heavy weight from the eastern European electronica scene: Raresh, together with his colleague Dan Andrei and local heroes Reiss and Tim Hoeben. Enjoy your hangover on Monday Amsterdam.